The noun “Nintendo” can also be used as an adjective. When a company makes players download a separate smartphone app for voice chat? That’s Nintendo. Friend codes? Very Nintendo. Not making Metroid Prime 4? SO NINTENDO. But last night, the company behind Switch made a move that was resoundingly un-Nintendo: it actually listened to fans. In January, when first detailing how the Switch’s online services will work, Nintendo said it would give out a free classic NES or SNES game every month that would have online play added. When pressed for details, the company explained that each of those games would in fact only remain free for a month. If anyone wanted to keep playing a game after that, Nintendo said, they’d have to buy it. Fans were frustrated by what they saw as yet another oh-so-Nintendo move. As Kotaku commenter Nicholas Payne wrote: “Yeah, I’ve gotta hope that ‘for a month’ thing is just Nintendo being characteristically bad at explaining things, because if the best they can offer is putting up a single 20-30 year old game a month to try and then give back... yeesh.” Others wrote editorials begging Nintendo to change course. The reactions were unanimously negative. Then, Nintendo did something unusual: it listened. Last night’s messaging was typically Nintendo, requiring a Kotaku request for clarification to find out exactly what was happening, but the news was widely cheered. 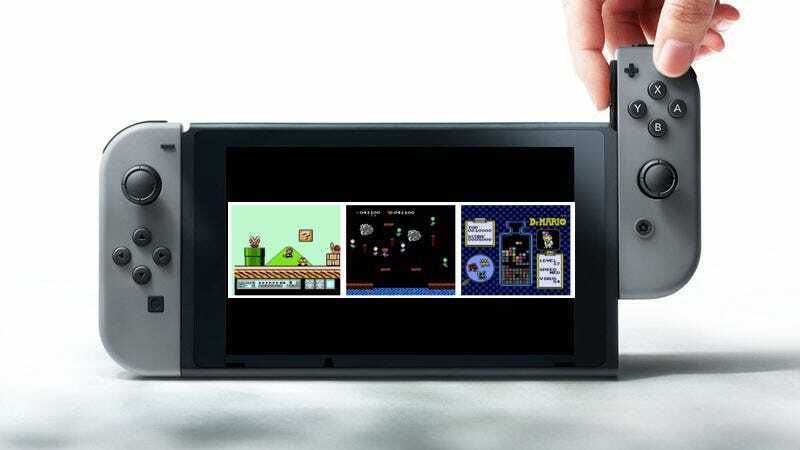 Not only will the Switch’s online service be significantly cheaper than its competitors, at $20/year, it will give subscribers access to a library of classic games, still enhanced with online play. No more monthly releases. You won’t have to worry about time running out. As long as you maintain your subscription, you can play as much as you’d like. Many questions remain, of course. We don’t know how many games will be available, or how often they’ll be added (or taken away). We don’t know what platforms this service will include—Nintendo says that “at launch the classic game library will include NES games. Super NES games continue to be under consideration, but we have nothing further to announce at this time.” Right now Nintendo has named only three games—Super Mario Bros. 3, Dr. Mario, and Balloon Fight—and it’s safe to assume, based on the company’s history of classic game support, that progress will move slowly. We also don’t know how the Virtual Console fits into this. Will the Switch’s classic games subscription service function as a companion to buy-once, play-forever classic games, or as a replacement? The usually-reliable sleuths at Eurogamer reported last year that the Switch’s Virtual Console would have GameCube games—if that’s true, how will that fit into all this? In an ideal world, the Virtual Console would have a robust library of purchasable games to supplement this Netflix-like model. Will that happen? Will Nintendo finally realize, after getting caught off guard by the NES Classic’s popularity, that throngs of its fans love old games? Answers will arrive soon enough. For now, it’s worth taking a second to zoom out and marvel at what happened over the past five months. Nintendo announced a policy, realized that people wouldn’t like it, and swiftly changed course. Could anything be less Nintendo?